Researchers at the University of Texas at Austin have miniaturized a children's toy into a tiny motor that could one day power medical devices or harvest solar energy. The device, called a radiometer, is based on a classical light-powered, rotating vane most often seen in mall novelty stores. But this radiometer is the world's smallest, with blades as thick as a human hair and a diameter about that of an eyeglass screw. 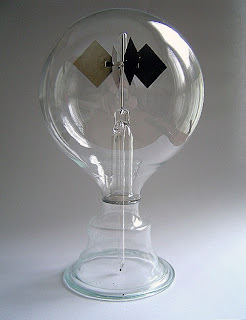 The radiometer you would find at a toy store looks like a weathervane housed in a light bulb. It has four blades placed propeller-style on a rod. Each blade is black on one side and silver on the other and when sunlight shines on it, the black side absorbs more light than the silver side and heats up. As with a light bulb, most of the air is removed from the radiometer, leaving a thin, low-pressure atmosphere inside. The air molecules near the black surface get warm, while the air molecules on the silver side of the blade stay cool. That creates a strong temperature difference between the two sides. It's this temperature difference that causes the air to flow and makes the propeller spin, generating a miniscule amount of power, but enough to be useful. By modifying the design and applying a high-tech coating to the blades, they were able to remove the bulb and make it small enough to navigate human arteries. "When there is a temperature difference between the gas and the room, there's a flow of air," said Li-Hsin Han, of the University of Texas at Austin who headed up the team of researchers. "We needed a tiny little motor to place at the end of a catheter, and we realized we could build a micromotor much smaller for cheaper-and with less effort-using this method." The approach is part of an effort to get high quality, 3D-images from inside arteries and blood vessels using a technique called optical coherence tomography (OCT). "OCT is a lot like ultrasound except it's a light-based approach, but it gives you a higher resolution so you can see greater detail," said co-author Chris Condit, an engineering grad student, also at the University of Texas. The micromotor would be attached to a catheter and an OCT imaging device and then inserted in an artery in the leg. The catheter could then be snaked through the veins and up the body to look for things like plaque buildup in the heart. Because there's obviously no sunlight in the body, this light-mill pulls its power from a laser run up through the center of the catheter. However, not everyone is convinced with the capabilities of the device. Kris Pister, a micromotors expert at the University of California, Berkeley, thinks the device is more of a scientific curiosity and doubts the device will be efficient enough to have the applications Han and his team hope for. "I think it's neat research, but wouldn't place too much faith in their application claims," Pister said. But according to Han, the FDA is reluctant to allow devices requiring any more than the tiniest voltage inside of veins and arteries. He argues that the micromotor fills a very real need and that they built it with that specific need in mind; the radiometer produces enough voltage and torque to move a tiny mirror at the end of the catheter. Normal micromotors produce more voltage can be used safely in an artery, he said. "If you just have a small amount of electricity leak into the blood vessels you can have major problems," Han said. "One volt is the most that we can have in a blood vessel." Building the motor, however, required an all-around reinventing of the century-old toy. When the group first conceived of the idea, they thought they could just miniaturize it and have a working power source. Han sent graduate student Chris Condit to an Austin toy store called Toy Joy, to buy some radiometers to take apart and figure out what it would require. The store is a frequent hangout for area hipsters with vegan soft-serve ice cream, two-headed baby dolls and walls covered in bizarre toys. Condit took the toys back to the lab and broke them into pieces, then he put them back together in a miniaturized form and modeled how much air the tiny motor would need. The team's first attempt to simply miniaturize the light-mill didn't work. The technology required to shrink the design small enough for use in a blood vessel was too expensive, so they gave up on the project. Then last year Han had a realization: because the radiometer simply relies on differences in air temperature, he could do away with the century-old flat vane design. He curved the vanes and coated them with gold nanoparticles to increase their absorption. The effect is that more light is absorbed on one side of the vane and a temperature difference still drives the rotation. Condit admits the device is still in its infancy and will need some refinement before it can be put to use, but he still has high expectations. As a childhood cancer survivor and creator of the world's longest annual charity bike ride-the Texas 4,000 for Cancer, which runs from Austin to Alaska-he hopes the micromotor will eventually find uses in cancer imaging. "It has yet to realize its full potential," said Condit. "There's still a lot of work left to be done." Preventing electrical charge leaking into the body is a very simple thing to do (many materials for hermitically sealing are also excellent electrical insulators). What I would be interested in knowing is how many times (if any) has an electrically powered device actually failed and leaked charge into a body? My guess is none. Additionally, if I were the designer of such a system, I would incorporate electronics to monitor the voltage going into the body. Leakage would be simple to detect, and it would be even simpler to stop the flow of power in a matter of a few nanoseconds, long before any damage can be done. Last point to make, as any Electronics Engineer will tell you, its not the volts that kills you, but the amps. You can deliver thousands of volts if the current is sufficiently limited (an average electrostatic discharge for example is 5kV to 25kV, but this the current resulting from the discharge is tiny, resulting only in mild discomfort). I am an electrical engineer and more importantly than the current is where the current flows. I could kill you with a small standard 9v battery if the leads were placed correctly. Typically the human body is protected by this nifty thing called skin which has a large resistance >1Mohm. The blood on the other hand (where this device is in use) due to the electrolytes is a very good conductor and since this device is used in the larger arteries and blood vessels it would tend to be fairly close to the heart. In which case all it takes is a few micro Amps of leakage current to screw up the heart rhythm. So sure I'll touch a live outlet box with my hand but if your putting something inside me it better damn well not have any wires connected to it. Anonymous 1- Radiometry is a field that studies measurements of EM-radiation, this isn't actually measuring anything. This is a modern re-imagining of a classical device called a radiometer, which was invented by Sir William Crookes in the 19th century.